So, Greenpeace forced Apple to go green, right? 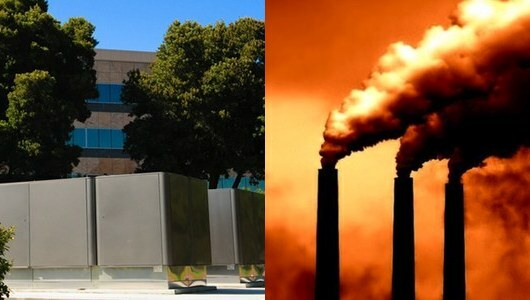 Beginning in early April, with the release of its “How Clean is Your Cloud” report, which raked Apple over the coals for using coal-generated electricity to power its Maiden, North Carolina data center, Greenpeace held a series of protests that criticized Cupertino for not being green enough. Then yesterday, May 17, Apple announced it is doubling the size of a planned solar array, obviating the need for nearly all grid energy at its data center. Greenpeace wins, their pressure tactics lead Apple to capitulate and double down on green energy, right? That’s more than the gist of Wired’s After Greenpeace Protests, Apple Promises to Dump Coal Power, but not so fast. The core of yesterday’s Apple announcement was that the North Carolina Utility Commission (NCUC) had approved Cupertino’s request to build a second solar array in addition to 100-plus acre solar array + 4.8MW fuel cell power plants approved last year, making for a more than 250 acre site that will eliminate the use of coal-fueled electricity at the facility. The punchline? The application for the second solar array was filed back on February 25, a couple months before Greenpeace published its report or “protestors” began showing up at Apple facilities worldwide. And, the NCUC approval process included a public comment period and public hearings — Apple was on the ball and ready to deliver 100 percent green-powered data centers months ago and information showing that was readily available to the public. Furthermore, the Maiden land deal didn’t “just happen” over the course of a few fevered weeks following Greenpeace’s April charm offensive. Anyone that’s ever purchased land, especially agriculturally zoned land like Apple acquired to site their second solar array, knows it takes months to negotiate a deal, gain regulatory approval and process the sale. Apple’s been working on this for months if not years and there’s a paper trail a mile wide showing exactly what they’ve been up to if anyone had chosen to follow it. If Greenpeace is a public watchdog, what exactly have they been watching? My guess is they’ve been breathlessly watching themselves on TV. In “How Clean Is Your Cloud,” Greenpeace claimed Apple’s NC data center would use 60MW of power and that the overwhelming majority of that would be coal-generated electricity from Duke Energy. However, Apple’s public statements and public filings clearly state the facility would use just 20WM — a difference of 300 percent. Moreover, Greenpeace overstated Duke Energy’s reliance on coal (55 percent), citing 2007 data, despite the ready availability of 2010 data filed with regulators showing a greatly reduced coal footprint (45 percent) in its generating mix. So, what exactly was Greenpeace’s report really about? What were the protests really about? Simple, they wanted to whore Apple’s good name and solid green credentials before Cupertino could close the deal and announce 100 percent green energy-powered data farms. The richly bitter irony of Greenpeace’s “How Clean…” campaign is that moving our music, data, movies, etc. to the cloud represents a vast reduction in resource use versus the old paradigm. Yeah, Apple’s iTunes + iCloud data centers — a.k.a. not storing, transporting and selling movies, music, data, etc. on optical disks or tape — is hugely more efficient and less environmentally damaging than the physical media of just a few years ago.